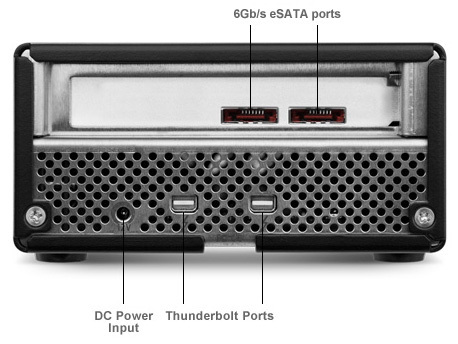 eSATA - 6Gb/s (or 600MB/s) Port / Interface Bootability Bootable on any Thunderbolt enabled Mac. EXTERNAL ENCLOSURE COMPATIBILITY3 Qualified and Supported Solutions: Oxford 924 NewerTech miniStack V3 Oxford 934 OWC Mercury Elite Pro Classic–Prev. Oxford 936 OWC Mercury Elite Pro Dual–Prev. OWC Mercury Elite Pro Dual Mini–Prev. WARRANTY 3 Year OWC Helios Limited Warranty 2 The best warranty is one you never have to use - but should the need occur - we're proud to provide a superior level of support and service coverage to our customers. OWC and NewerTech storage solutions come fully backed by an Industry-leading 48-hour turnaround time, for complete peace of mind ownership confidence. Performance may vary by machine. A sleep conflict may be encountered when using certain eSATA chipsets via the eSATA ports when booted to the Accelsior_E2. See the specifications tab for affected solutions where System Sleep mode MUST be disabled in order to ensure reliable operation. Allowing system sleep to occur while one of the affected external drives is connected via the Accelsior_E2 eSATA ports could result in loss of data following wake from sleep. Although the above are our general recommendations for use, wake from sleep has been determined to only be an issue when the Accelsior PCIe is used for startup (SSD or eSATA connected device). We are working with our partners to see that the sleep/wake function is fully supported with all solutions and startup scenarios.